Caption for the above photograph: "Doramad was a toothpaste created in Germany in 1945. It was made by Auergesellschaft of Berlin, a company that was founded by the inventor of the gas lantern mantle, Carl Auer von Welsbach. 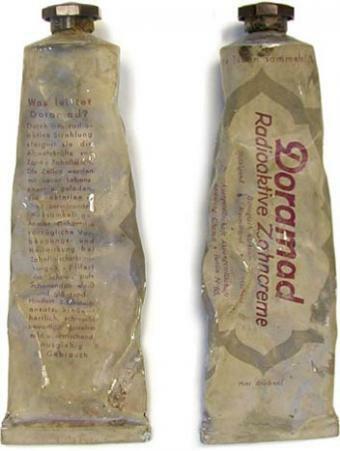 On the back of the product’s tube it stated that ‘radioactive radiation increases the defenses of teeth and gums… cells are loaded with new life energy, the destroying effect of bacteria is hindered… it gently polishes the dental enamel and turns it white and shiny.’"
As part of nuclear-themed posts in the run-up to the Chernobyl anniversary on 26 April, this post covers radioactive elements in their heyday, right after they were first discovered. There was a time when radiation from these elements was associated with the power of the sun - and the future. As incredible as it may seem, radium, a highly radioactive element, was seen up to the middle of the last century as a health treatment. Radium was discovered in 1898 by Maria Skłodowska-Curie and her husband Pierre. 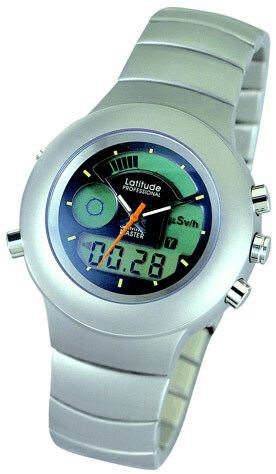 New World Encyclopedia: "It was once used in luminescent paints on watch dials, and in the early twentieth century it was added to products like toothpaste, hair creams, and certain foodstuffs, based on the belief that it had curative properties. These ... uses were discontinued when the adverse effects of radium were discovered." The following are pictures of actual products - from toys to suppositories - that were marketed as revitalizing, empowering or inherently fascinating because they were radioactive. 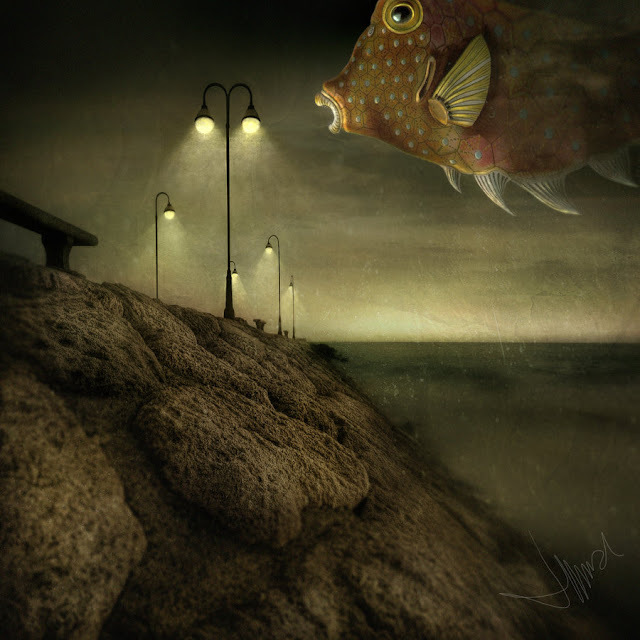 Unbearable Lightness (2010) © by Elsilencio. Reproduced with kind permission. The Wall Street Journal has reprinted some messages exchanged on 23 March between TEPCO workers regarding the conditions under which they are struggling to contain the problems at the Fukushima I and II nuclear plants. They are heartbreaking reflections on drastic courage. If you pray, remember these brave people in your prayers. Remember them, even if you don't pray. They are all that stands between us and disaster. They have been working incessantly since the earthquake on 11 March to stabilize the nuclear crisis. Incidentally, Fukushima (福島市) means good fortune island; let's hope that the place lives up to its name. What follows below is quoted directly from the WSJ and all credit for translation and reporting belongs to them. Note that the report does not fully clarify where the writers are referring to Fukushima I (the Dai-ichi plant) which is where the major problems are occurring - or to Fukushima II (the Dai-ni plant), which has been shut down. But even then, at the Fukushima II Dai-ni plant, one worker died in a crane accident on 13 March and four others were injured, which tells you how desperate conditions are. 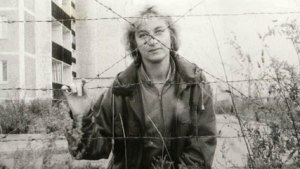 Natalia Manzurova, shown here in 1988 in the "dead zone" of the Pripyat, is one of the few survivors among those directly involved in the cleanup of Chernobyl. About a week ago, AOL News reported on Natalia Manzurova's words of warning for the workers who are desperately trying to contain the brewing disaster in Japan's wrecked Fukushima nuclear power plant. Manzurova is one of the last surviving workers who worked to contain the Chernobyl disaster and she is on a tour of the United States this week. At the time of the Chernobyl disaster, she was a 35-year-old engineer. She spent four-and-a-half years helping clean the area. She still lives in Ozersk, a closed town in Russia. The town is near the Mayek plant which featured the second-worst nuclear accident in history, the Kyshtym disaster of 19 September 1957 (I will blog about that incident in April). Ozersk is still highly radioactive, so it's strange that her words of advice for the Japanese workers in Fukushima are: "Run away as quickly as possible. Don't wait. Save yourself and don't rely on the government because the government lies. They don't want you to know the truth because the nuclear industry is so powerful." She bears the so-called 'Chernobyl necklace,' also known as the 'Belarus necklace,' a scar formed after an operation conducted to remove her thyroid gland. You can see a graphic photo of the necklace here. She is the author of Hard Duty: A Woman's Experience at Chernobyl. She explained that when called to help contain the Chernobyl disaster she had no idea how bad it was. And if asked today to do the same task, "I'd never agree." She and her fellow liquidators dug holes and buried animals, machines and buildings. She described it as an unearthly experience: "I always felt I was in the middle of a war where the enemy was invisible. All the houses and buildings were intact with all the furniture, but there wasn't a single person left. Just deep silence everywhere. Sometimes I felt I was the only person alive on a strange planet."